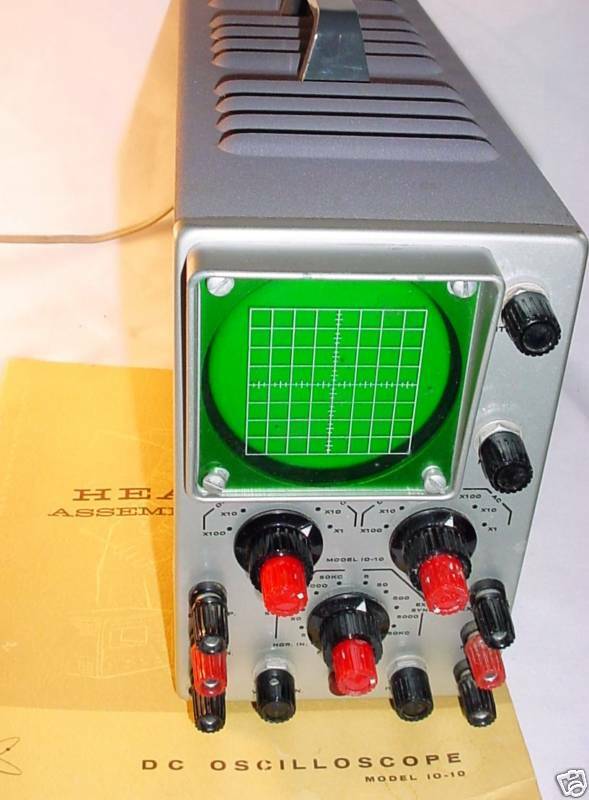 EarlyComputers: The Heathkit DC Oscilloscope. The following is taken from the Heathkit Assembly manual. "This Model IO-10 Oscilloscope was designed as a small compact instrument containing identical DC coupled vertical and horizontal amplifiers. DC coupling in the amplifier channels of the IO-10 Oscilloscope allows it to be used with low frequency phenomena from over 200 kc down to DC. The small physical size of the IO-10 tends to alleviate workshop congestion and permits the oscilloscope to be moved about with ease. Also the negligible phase shift between the vertical and horizontal amplifiers makes the IO-10 ideal for specialized uses such as computer read-out." Because of it's ability to be used as a computer read-out, this model was a popular choice to use with the Heathkit EC-1 analog computer. As with many analog computer, the EC-1 was equipped with a rudimentary voltage meter. The addition of the oscilloscope allowed for a much greater variety of of output. Nowadays, we are used to seeing the computer monitor & speakers as our "read-out" and they supply us with text, images, movies and sound. In the days of the analog computers, the outputs consisted of voltage meters, oscilloscopes and graphing machines.